Officine Panerai has created a new limited edition Luminor Marina set to be launched in August at Officine Panerai boutiques in Shanghai and Beijing as well as selected authorized China dealers. 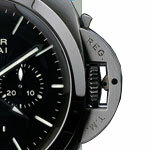 A wider release is planned to include all Panerai boutiques in Greater China. 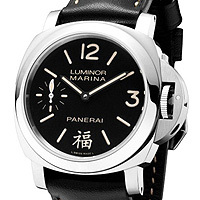 The Panerai Luminor Marina PAM 366 “Fu” China celebrates the fifth year since the brand first entered the Chinese market and the great success the brand has experienced there. 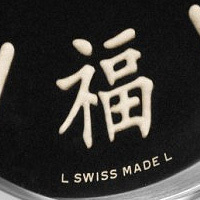 The special edition Panerai watch carries the Chinese sign for "Good Fortune" or "Fu" which can be found on the dial at 6 o'clock. The symbol is a time-honored Chinese character for good fortune or happiness which includes five aspects: longevity, prosperity, health, virtue and a well-ended life. The PAM 366 has a 44 millimeter sculptured polished and brushed stainless steel case. The black dial has white luminous markers and displays hours and minutes as well as a small seconds hand at the 9 o'clock position. The Chinese character “Fu” is at the 6 o’clock position. The timepiece is powered by the brand’s exclusive hand-wound mechanical movement - OP II Calibre. The 17-jewel movement, which beats at 21,600 vibrations per hour and provides a 56-hour power-reserve. The movement guarantees precision of the COSC-certified chronometer. The superior case construction allows for a 300-meter water-resistant. The case is secured to the wearers wrist with a personalized black calf strap featuring ecru stitching and fitted with a polished steel buckle. The brand plans to create 1,500 pieces with a retail price of around $4,400. 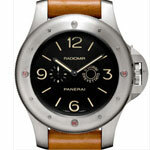 Check out this new edition from Panerai's Special Editions Collection. The newest edition of the Radiomir family is a titanium 47 mm watch. Inspired by the brands first watches produced back in the 1930s which were used by the Italian Navy. The new Radiomir is not produced in the traditional stainless steel of the original models but in highly durable grade 2 titanium. This new titanium model has the easily recognizable cushion-shaped case that has become one of the trademarks of the brand. The watch features a screwdown case-back reveals a sapphire crystal window. Available with a brown or black dial, the dial is protected by a 1.9mm-thick sapphire crystal that's been treated with anti-reflective treatment. The dial has been created with a sandwich construction which incorporates two superimposed plates provided with the luminous substance. The dial features large Arabic numeral markers and baton-shaped hour markers. 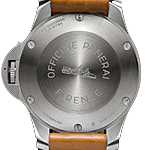 The screw-down crown displays the Panerai logo has the shape of a truncated cone similar, again, to the original Radiomir models. The Panerai Radiomir Titanium 47 mm watch is powered by the calibre OP XXVII movement, a manual wind movement that measures 16 lignes in diameter. Based on a Minerva movement the movement has 18 jewels movement, with a balance frequency of 18,000 alternations per hour. The movement has a 55-hour power reserve and is water resistant to 100 meters. The watch is completed by an alligator leather strap and an oversized brushed titanium buckle. The versions are limited to 50 and 100 pieces. 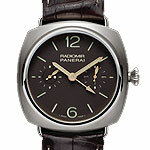 Panerai Radiomir's were previously available in much larger cases, now with the help of a brand new in house movement, the brand has introduced the Radiomir PAM 336 watch. This 42 mm pink gold timepiece is an attractive design that is both smaller and thinner than the previous Radiomir versions, which has been made possible by the new hand-wound mechanical movement P.999 caliber that was designed, developed and produced completely by Panerai. The Panerai Radiomir P.999 42 MM Pink Gold watch will only be available in a numbered limited edition of 500 pieces.The P.999 caliber itself measures just 27.4 mm in diameter by 3.4 mm thick, making it smaller than other calibers that the brand has previously released. Made up from 154 components which includes 19-jewel, this single-barrel movement allows for a 60-hour power reserve. The balance wheel which beats at 21,600 alternations per hour has been fitted with adjusting screws and an Incabloc anti-shock device protection. And while we won't be seeing this new movement in many of the new Panerai watches, it has been reserved for some of the Panerai Historic Collection models. While most of Panerai previous watches have cases that range in size from 44 to 47 mm the new Radiomir PAM 336 new Radiomir watch has a beautiful pink gold case that measures in at just 42 mm. 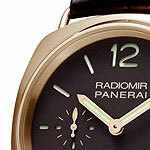 Keeping the shape of classic Panerai cases it is simply thinner and lighter compared to the previous Radiomir models. The pink gold case has a satin finish while the bezel has been polished. 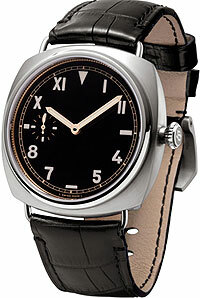 The dial is chocolate brown with the standard Radiomir layout which has the small seconds dial at the 9 o'clock position. The face of the watch is protected by an anti-scratch and anti-glare sapphire crystal. The PAM 336 is completed by a brown alligator leather strap which has been fitted with a pink gold pin buckle. 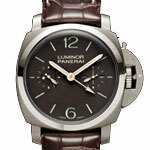 One of Panerai's newest releases is the Luminor 1950 8 Days Rattrapante watch, reference PAM00319. This limited edition timepiece is manufactured to just 300 pieces. Powered by the brand new Panerai hand-wound calibre P.2006/3 mechanical movement that oscillates at a rate of 28,800 vibrations per hour. It has three barrels, 356-parts, and 34-jewels. It allows for an 8-day power reserve which is easily viewed via a linear power reserve indicator. The watch has a column-wheel split-second 30-minute chronograph, and small seconds displayed on a sub-dial. The functions on the watch are hours, minutes, small seconds, linear 8-day power reserve indicator, seconds reset, and the split-seconds chronograph with two counters. The case measures 47 mm in diameter and is crafted in brushed 18 carat pink gold with an 18 carat pink gold fixed bezel. The case has two buttons - one for the split-seconds function at the 8 o'clock position and one for the chronograph functions at the 10 o'clock position. The fluted crown is locked with security lever. The dial is protected by an anti-reflective sapphire crystal. 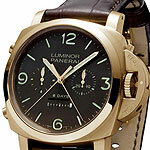 The brown dial has Arabic numerals covered with green luminous coating for easy readability. The case-back has a sapphire crystal display back. The watch is completed by a brown personalized alligator leather strap fitted with a polished 18 carat pink gold adjustable buckle. It is has a water resistance of up to 100 meters. The new PAM 341 Radiomir Egiziano is a rare watch with only 300 pieces being made which is part of the 2009 special edition lineup. The PAM 341 has a huge case size measuring 60mm produced in brushed titanium. This watch is an amazing recreation of a classic, historic and unique piece and is sure to be one of the most sought after watches for Panerai enthusiasts. Based off of the original stainless steel GPF 2/56 watch that was created for Commandos of the Egyptian Navy back in 1956, only fifty of these watches were made. The GPF 2/56 had a 16″ Angelus 8-day movement, and a rotating bezel. 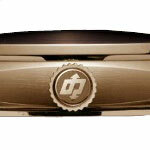 The signature Panerai security lever on the crown enabled the watch to be wound under water. The Panerai PAM00341 features a hand-wound P.2002/7 calibre movement, which includes 13 3/4 lignes, 21 jewels, Glycydur balance, an 8 day power reserve, KIF Parechoc anti-shock protection, and three barrels which totals 191 components. The dial displays hours, minutes, small seconds, and seconds reset. Protected by a sapphire crystal formed of corundum, 5.8 mm thick treated with an anti-reflective coating. The watch is completed with a leather strap and a large brushed titanium sewn-in buckle. Water resistance is rated at 100 meters. 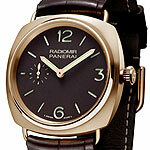 Officine Panerai has unveiled a new addition to its the Radiomir collection, the Radiomir Egiziano watch which will make it debut at SIHH 2009. The new Egiziano watch is a recreation of a special model that Panerai produced in the 1950's in extremely small numbers for the Egyptian Navy. The reproduction will only be available in a very limited edition of 300 pieces.The Radiomir Egiziano has a matte black "sandwich" dial with yellowed luminous indications. The timepiece has a brown leather strap with a flat brushed titanium "GPF-Mod Dep" tang buckle. The Radiomir Egiziano is water resistant to 300 meters. The oversized case is constructed from brushed titanium and measures 60mm across. 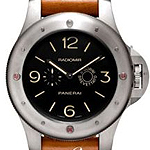 The Radiomir Egiziano features the Panerai crown security device inherited from the original watch developed for the Egyptian Navy, as well as a bi-directional rotating bezel. While the Egyptian navy watch's original model was equipped with an Angelus hand-wound movement that offered an 8-day power reserve, the new Egiziano features the Officine Panerai in-house P.2002 caliber. The watch has a 8-day-power-reserve and a glucydur balance borne upon an adjustable bridge. The balance frequency is 28,800 vibrations per hour. New to the Panerai Ferrari Collection is the Ferrari Scuderia Chrono 1/8th second. Inspired by the Enzo, which had the distinct honor of being the fastest Ferrari car ever created. The Enzo was a limited edition creation with just 399 examples, the new FER00025 timepiece will be limited to only 300 pieces. The stylish and very sporty watch has the unmistakable yellow accents used in all of Panerai's Scuderia Collection, including the shield, hands, and Tachymeter scale. The movement for the Ferrari Scuderia Chrono 1/8th second is the automatic mechanical Panerai calibre OP XXI, with 13¼ lignes and 42 jewels - which produces 28,800 alternations/hour. The black dial has the Ferrari shield applied at 12 o’clock, and displays hours, minutes, chronograph split-seconds with two counters, one with 1/8th-second sub-divisions, and a tachymeter scale. The steel case is 45 mm in diameter with a polished finish with brushed edges, the bezel is brushed as well. Two straps come with this watch, one in rubber with incised Ferrari inscription and the second strap in black leather with contrasting stitching, inner lining in yellow cayman with yellow stitching. The watch has a 42 hour power reserve and is water resistant to 100 meters. Officine Panerai is introducing a new limited edition timepiece for its “Ferrari Engineered by Officine Panerai” collection. Created to coincide with the car makers launch of the Ferrari California. The new two-counter chronograph has a 45mm cushion-shaped case crafted in brushed stainless steel with nicely complimentary polished elements on the lugs and case corners. The push pieces and winding crown feature a machined knurled surface, with Ferrari's Prancing Horse emblem placed on the winding crown. The black dial of this watch has white and “Ferrari Red” accents, such as the area between 12 and 3 o'clock where there is a red semi-circular sweep inspired by the tachometer instrumentation inside the Ferrari car. 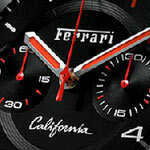 The Ferrari “California” brand emblem is placed on the dial just above the six o'clock mark. The dial is protected by a convex sapphire crystal and the watch offers 100-meter water-resistance. The Panerai for Ferrari California Flyback Chronograph watch features a self-winding mechanical movement, with a frequency of 28,800 beats per hour that guarantees timing accuracy to the nearest 1/8th of a second. The watch also features a flyback function, which makes possible the use a single push of the button for stopping, resetting and restarting the chronograph function of the watch. 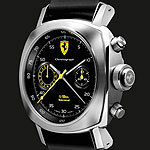 The movement has an engraved rotor that displays the "Cavallino Rampante" Ferrari company insignia. The watch is nicely complimented by the well padded white stitched alligator strap. 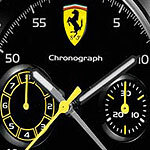 The Ferrari California Flyback Chronograph will be a limited edition production of 400 pieces. Here we have the new Luminor 1950 8 Days Chrono Monopulsante GMT, the chronograph watch will be released in 500 millesimed units - 250 with a steel case and 250 with a 18 karat pink gold case. The watch features the same sophisticated mechanical movement as the previous versions as well as the traditional Luminor 1950 case, which is a nice large size at 44 mm in diameter. 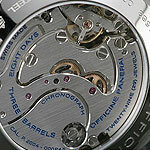 The manually wound movement is the P.2004 which was designed and manufactured entirely by Panerai, and is unique among chronograph movements. The movement has 321 component parts which includes 29 jewels and is viewable through the transpart case-back. The movement has many great features, like a power reserve of 8 days, a linear indication of the amount of running time remaining, and a second time zone with day/night indication. 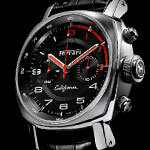 It also has a device for zeroing the seconds hand and a single-button chronograph with column wheel and friction clutch. The steel case version has a brushed case with polished steel bezel. The dial is black with luminous Arabic numerals and hour markers. There is a minute counter at 3 o’clock, a small seconds and day/night indicator at 9 o’clock, a horizontal power reserve indicator at 6 o’clock, and a central chronograph hand. The sapphire crystal is made from corundum at 2 mm thickness, and has been treated with an anti-reflective coating. 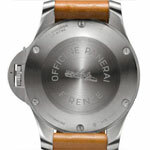 The strap is a beautiful PANERAI personalised alligator strap which has a large-size brushed steel buckle. The steel version has a black alligator strap and the gold version has a brown alligator strap. The reference for this watch is PAM00275. It is water-resistance to 100 meters. 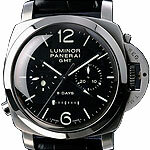 It was just last year that Panerai introduced the P.2005 Tourbillon GMT movement in its PAM00276 model. Though many thought the addition of a tourbillon model was a somewhat strange step for the sport-watch focused company, they have now proven themselves capable of achieving this substantial technical challenge. Now, with the success of its release Panerai gives us three new tourbillon models - the PAM00306 a Luminor 1950 Tourbillon GMT in titanium or steel, the PAM00315 Radiomir Titanium Tourbillon GMT, and the PAM00316 which is the Platinum version of the PAM00315. Panerai's tourbillon movement has some very distinctive features, the first being its unusual perpendicular position inside the case. The second, the rate at which the cage moves is twice that of most tourbillon movements completing two revolutions per minute. The tourbillon itself is only visible through the sapphire crystal on the back of the case. The only evidence of the tourbillon on the dial is a small blue dot within the seconds subdial which rotates every 30 seconds. The PAM00306 has 47mm brushed steel or brushed titanium case with a polished bezel and a 2mm thick see-through sapphire crystal case-back. 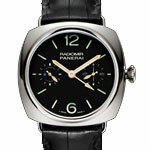 Its hand-wound mechanical movement, Panerai Calibre P.2005, has a 6 day power reserve. It features hours, minutes, seconds, second time zone, power reserve indicator on the back, 24 hour indicator, and of course Tourbillon. It comes on an alligator strap with a brushed large-size buckle and is Water resistant to 100 meters. The PAM00315 and the PAM00316 have a 48mm brushed titanium or platinum case with removable wire loop strap attachments. The bezel is polished titanium or platinum and has a see-through sapphire crystal case-back. The hand wound movement, Panerai Calibre P.2005, features three spring barrels and 31 jewels. The functions of the watch are hours, minutes, seconds, second time zone, power reserve indicator on the back, 24 hour indicator, and Tourbillon. It comes on an alligator strap with a large-size brushed titanium buckle or white gold buckle. It is Water resistant to 100 metres.